This year, I had two major “aha!” moments, both while driving and both related to food. Out of the first, back in January, came the topic for my master’s thesis. The second, which happened today, gave me the idea for my next project. It’s called “Ordinary Kitchens,” and will chronicle the stories behind the best dishes I have encountered in the homes of my friends and family. I’ve tried to figure out what I really want to learn and why. I’ve been both light hearted and serious in my approach. I’ve created a recipe blog and studied food policy at the graduate level. I’ve waded through serious and paralyzing self doubt. I’ve questioned whether or not I can make a positive impact on a food system that doesn’t work the way I’d like it to. I’ve tried to decide if I should cook or write, or go to culinary school or get a Phd. Here’s what I know: food is the starting point of everything else in life. It’s as simple and complex as we are. It’s what we make of it. Not a day goes by where we don’t think about it and touch it and plan around it. Because of that, there is knowledge and richness to be soaked up absolutely everywhere. So, I am enrolling myself in cooking school by taking the time to discover the hidden secrets in all the ordinary kitchens in my life. Then, I’ll share what I find out here. If one instant driving in the car can be so life-altering, imagine how far preparing an entire meal can take us. 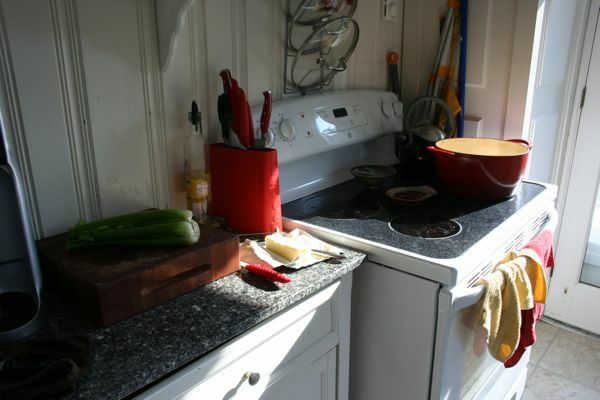 You are so creative—great kitchens in your life and what you take away from them! You’re right kitchens may actually be the center of the universe, who knows may even be the secret to life. Love it! It is wonderful to see your post again. Great concept. Do I love you??? You are so creative….go Samantha!! What a great idea! I can’t wait to see how your idea unfolds! !